Roxy Review: Time For A Hoolie! 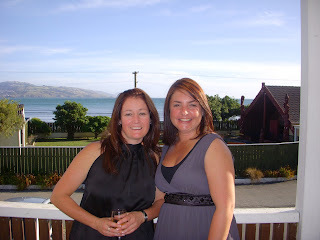 Last weekend I flew up to Wellington for the wedding of PJ Solomon who I met whilst living abroad in Edinburgh. There were others there who had also lived in the 'burgh so it was a great reunion! Swayze and I flew into Wellington within half an hour of each other which worked out perfectly. We caught a shuttle to the motel in Plimmerton where we were staying (Note to Shuttle driver: Find 5th gear, and use it!) And were enjoying our first wine just after 5pm. Brilliant! Jeremy and Kelvin arrived separately not long after and a few more wines were had before we headed down to the marae to meet up with the others. 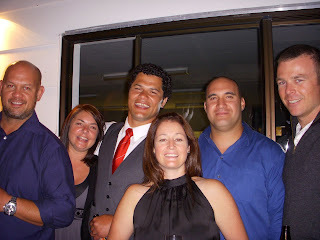 The Solomon family had prepared a boil up which was YUMMY and we got to meet the bride for the first time. Helen is from Estonia and just 16 weeks ago had a wee boy with PJ. Saturday was the big day and it was beautiful weather. Helen looked absolutely stunning and PJ scrubbed up well too! 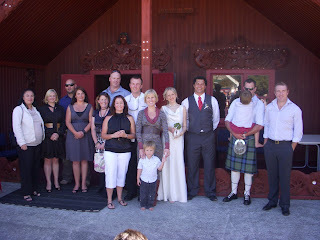 The wedding was held on a marae and all the friends were welcomed on and got to sit up the front - perfect viewing position. After the short ceremony there was plenty of time for photos before heading up the hill to the reception. Again, we were invited to go in first and got front row seats!! The hungi was yummy. Speeches were good and even the Bride got up and said a few words before all the guys got up and did a haka for her - even PJ's Dad had PJ's son, Rasmuss, in his arms while he participated. It was very cool and quite emotional. It was a great night. Lots of catching up with fellow Flat 6ers and others who had not quite been lucky enough to live there but had been there and/or heard the tales. Swayze and I headed out to the airport on Sunday morning after an exhausting but thoroughly enjoyable weekend. Another exciting win for us last Thursday at netball. Two for two. We better not get too cocky as we are playing the top team this Thursday. Eeek! We are third on the results ladder. I had a weekend at home this weekend just gone. The first one in what seems like ages. I felt very productive and got lots done - including clearing the vege garden of weeds. It now resembles a garden again instead of a jungle. Claire was feeling poorly during the weekend which wasn't good so I made her stewed apples. She is still not feeling 100% so hopefully will feel better soon. Not nice to be sick - ESPECIALLY on the weekend! Whilst checking in a passenger Mike looked over to Courtney and with one hand made a gesture that Courtney took as being scissors, and pretended to hold something up with the other hand. Now, any NORMAL person (Courtney) would think that perhaps he wanted a pair of scissors to cut whatever it was he was pretending to hold up, no? But NOOOOO, apparently from his silly gesture Courtney was supposed to work out that he was wanting to know where the security items are kept. What the??? The 'scissors' = 'sharp and pointy items' = 'security items'. Right. No one can work out what he was doing with the other hand. He's a diddle. 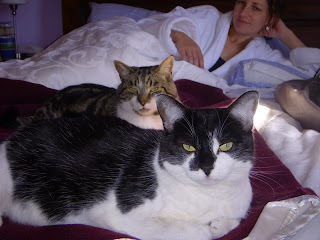 Toby and Min say 'hi' too.